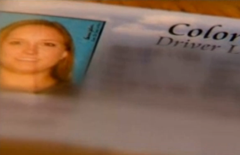 An Applebee’s waitress in Colorado is having quite a turn of luck after weeks of fretting over her stolen identity. Her wallet was swiped during a night on the town with friends in February, and since then someone was writing hundreds of dollars in bad checks. Her driver’s license, credit cards and cash were all gone, too. But then one of her customers got dumb. KUSA reports that the woman was working at Applebee’s a few weeks after her wallet was stolen, and had a table of customers who seemed pretty average. Then they started ordering drinks. “Four people come in, walk in, sit down. They start ordering drinks. This girl hands me my ID as a fake ID,” she said, adding that she was dumbfounded that someone would hand over an ID to the person they took it from. “My ID? You give me my ID?” she laughed. Instead of flipping out, she kept her cool and finished taking orders, before heading to the phone to call the cops. Police arrived on the scene soon after and arrested the woman — who was apparently 26 and therefore could’ve used her own ID to order booze. Here’s where we’re shaking our heads in disbelief.